As we become more obsessed with natural health, beauty, and general wellness, our society continues to discover and uncover the overwhelming benefits of many different ingredients and natural substances. Many of these substances are in the form of oils, which can provide many significant benefits for your skin and hair; some could be used in cooking recipes, depending on the oil. Regardless of how you use them, natural oils are taking the health and beauty industries by storm, and you just may be surprised that you already know some of their sources. Maracuja oil, also called passion fruit oil, is derived from the passion flower plant, which produces the passion fruit, and is widely loved around the world for its sweet and versatile taste. The fruit itself is a great source of fiber and often praised for its ability to improve digestive health and help treat those who suffer from asthma. The seeds of the passion fruit produce a beneficial oil, which typically has a very vibrant yellow color. The oil is often used in skincare routines because of its high concentrations of antioxidants and essential fatty acids. The passion flower plant, scientifically or botanically known as Passiflora edulis, may sometimes also be referred to as purple granadilla. The plant is native to areas of South America and Africa but has spread to areas of Australia and Hawaii, as well. The passion flower plant can grow to heights of 15 to 20 feet in a year and can live up to 3 to 15 years in fertile conditions. The fruit has a round or oval shape and is dark purple or yellow in color. Although both the pulp and seeds of the passion fruit are edible, you must wait until the fruit is ripe before eating, as an unripe passion fruit has many toxins present that, otherwise, would have died with age. Considering this, ripe passion fruit is commonly used in juices and other fruit products such as jams, butters, and syrups. Any production of the fruit will provide health benefits, however, the best way to enjoy the powers of the passion fruit is by using the oil derived from it. When made into an oil, the essential nutrients present in the fruit are much more potent, including vitamin C, vitamin B complex, iron, and phosphorous. These nutrients provide many powerful benefits and properties. Although maracuja oil still needs a lot of research to be completed, it has already been proven that the oil is a powerful emollient and has anti-inflammatory, anti-insomnia, anti-itching, and antioxidant properties. It is also possible the oil has other beneficial properties, including anti-stress, anxiolytic, antitussive, and anti-asthmatic. Maracuja oil has a very high concentration of linoleic acid, which is beneficial for people with sensitive skin or people prone to acne breakouts. It is also rich in other beneficial fatty acids, including oleic and palmitic acid. In fact, these essential fatty acids make up the vast majority of the nutrient composition of maracuja oil. Linoleic acid, in particular, is also known as vitamin F and is a polyunsaturated Omega 6 that provides many benefits for different skin conditions. Thanks to its high concentration of essential nutrients, maracuja oil provides many health benefits that can be enjoyed by people of almost any skin type. Its most powerful and commonly used benefit is the ability to help prevent and treat inflammation. Maracuja oil has excellent emollient properties which can help hydrate and moisturize the skin. It is particularly useful for people prone to dry skin but people with most skin types can benefit. Some people are sensitive to this oil so it is best if you perform a patch test before applying a larger dose. To apply the oil to your skin, simply take a few drops in your palms and rub it gently into your skin paying close attention to any dry patches. The oil is nice an light and your skin will not feel greasy after it you apply it. If you are treating large areas of your skin, you should dilute the oil with a carrier oil. There are plenty of carrier oils to choose from such as coconut oil, olive oil or jojoba oil. The treatment will be equally as effective and your maracuja oil will go much further. Exposure to the sun can cause a great deal of damage to your skin resulting in your skin looking weathered, old and wrinkled. Maracuja oil can protect against the damage caused by harmful UV rays and protect against many of the signs of premature aging. Constant exposure to the sun’s rays can also lead to melanoma and other types of skin cancer. While this oil may not be sufficient on its own to protect your skin completely from sun damage, it can certainly help. The antioxidant nutrients found in maracuja oil can protect against damage while its anti-inflammatory and emollient actions can help treat sunburn and skin irritation. Because of its excellent anti-inflammatory properties, maracuja oil may help to treat common inflammatory skin complaints including psoriasis, eczema and rosacea. Try applying the oil to the affected areas of your body but it is better to dilute it with a carrier oil to ensure against reaction and to make your oil last longer. While maracuja oil is best-known for its effects on the skin, it can also be used as a massage oil to relieve painful or aching muscles. Its anti-inflammatory effects also make it a good natural remedy for joint pain caused by osteoarthritis or rheumatism. Before massaging it into your painful muscles and joints, dilute your oil with coconut oil or olive oil. The linoleic acid found in maracuja oil makes it a great option for reducing inflammation and easing pain in both your muscles and your joints. For the millions of people around the world that suffer from stress or anxiety, maracuja oil may provide some welcome relief. People who suffer from these conditions are no doubt familiar with the strong pharmaceutical medications that are so often prescribed. Unfortunately, these medications do not always work and the potential side effects and risk of dependency make a natural alternative very attractive. Try inhaling the oil directly from the bottle or rubbing a few drops into your temples at times of anxiety. In its traditional uses, the Aztec people praised maracuja oil for its ability to help treat insomnia. According to proponents, maracuja oil has a natural, sedative effect that can relieve tension and anxiety and put your mind and body in the right place for a nice, long sleep. A few drops of maracuja oil added to your pillow or a warm bath may help treat insomnia and ease anxiety. Alternatively, add 10 or 15 drops of maracuja oil to your bathtub and take a long soak just before bedtime. Maracuja oil can also be applied to your hair and scalp to promote healthy and strong hair growth and to treat damaged and dry hair. Its anti-inflammatory and emollient properties also work wonders on your scalp and can help relieve irritation from conditions like dandruff. To treat scalp irritation, simply take a few drops and massage it into scalp before taking a shower. Let the oil penetrate into your hair and skin for a while and then wash your hair as normal. To treat broken and dry ends, shower and towel dry your hair. Then add several drops to your hands and apply the oil to the ends of your hair. You should not use more that three or four drops since it may leave some residue. While there are no studies into the effects of maracuja oil on respiratory health, research has been done into the fruit. 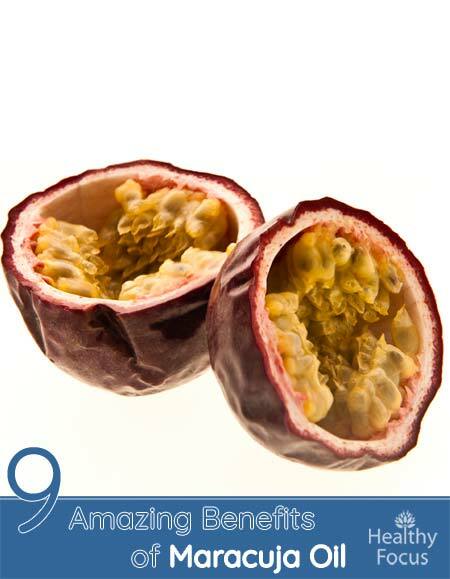 Maracuja oil may also help reduce cholesterol and blood pressure which are both major risk factors in heart disease. However, it is important that you do not take this oil internally unless you are under expert medical supervision. Before attempting to treat any condition with this oil (or any other natural substance), it is best to speak with your doctor to see if it will be suitable for you and your condition. Maracuja oil is also commonly used as a powerful emollient, which means it can help keep your skin hydrated by locking in moisture and increasing elasticity, naturally. Although maracuja oil is generally safe for all skin types, you may want to dilute it with a carrier oil, such as coconut or almond oil, especially if you suffer from very dry skin. Essential oils are highly concentrated versions of the natural oils found in plants. Carrier oils, also called base oils, are mixed with essential oils to dilute them and alter their absorption rate. They are called carrier oils because they carry the essential oil onto the skin, and they allow for coverage of a much bigger surface area, such as the entire body. You should also test the oil on a small patch of skin first, to make sure you don’t have an allergic reaction to it, before adding it to your daily skin routine. While the most typical uses of maracuja oil are for the skin and hair, it may also provide health benefits when ingested. On that basis, you should be careful how much you ingest and always speak with a doctor or holistic healthcare practitioner to be sure that you are taking the right dosage. A comedogenic rating is a rating given to natural substances, for the purpose of helping people determine which substances may be right for their skin. The ratings are given on a scale from zero to five, and the lower numbers are given to substances least likely to cause an allergic reaction, on even the most sensitive of skin. The lowest-rated substances are called non-comedogenic and are often used as carrier oils to help dilute harsher essential oils, because they are gentle on sensitive skin. Maracuja oil has been given a rating of one or two on the comedogenic scale, thanks to its high concentration of linoleic acid. This means using the oil shouldn’t cause an allergic reaction on your skin or make conditions such as acne become worse, however, be careful when using this oil for the first time, especially if you know your skin is prone to allergic reactions. Even if a substance has been given an extremely low rating, you may still have an allergic reaction to it, just as you might not have any reaction to a substance with a high rating. When applied topically, maracuja oil is generally regarded as safe but there are a few precautions to be aware of. Some people are sensitive to maracuja oil. It is better to dilute it with a carrier oil before applying it to your skin. You should also perform a patch test before going ahead and applying a large dose to your skin. Maracuja oil should not be taken internally unless under expert supervision. Overall, maracuja oil, or passion fruit oil, provides many significant health benefits that are hard to deny, especially when so many scientific studies have been done to prove those benefits. With that said, not all oils are suitable for every person and every skin type. Taking this into account, it’s best to speak with your doctor before attempting to use maracuja oil to treat any serious conditions, especially if you’ve already been prescribed other medications or treatments. You should also speak with your doctor before using maracuja oil, or any other natural oil if you are pregnant or are trying to become pregnant, as some applications may cause negative side effects to do with pregnancy.